A photovoltaic module or photovoltaic panel is a combination of packaged interconnected assembly of photovoltaic cells, also known as solar cells. These cells are made of two layers of semiconductor material. When light enters the cell, electrons are forced to flow between the layers to produce current. With the help of Solar energy a single photovoltaic module can produce a certain amount of wattage, installations intended to produce larger electrical power capacity require an installation of several modules or panels and this is known as a photovoltaic array. The Photovoltaic electric cell uses the photovoltaic effect to generate electrical energy or the potential difference that producing between materials, when the surface of the cell is exposed to electromagnetic radiation. There are two types of solar panels poly-crystalline and mono-crystalline. Both are made-up of silicon. The main difference is that the poly-crystalline material is made up of millions or billions of small silicon crystals, but Mono-crystalline material is made up of one large single crystal of silicon. The major quality difference is mono-crystalline solar panel is more efficient at converting photons to electrons for electricity while the poly-silicon is less efficient because electrons are captured or generated less efficiently where the crystals of silicon touch. Mono crystalline solar cells have the power to create current at cloudy condition and even when it is raining. Poly-crystalline panels are commonly used because the manufacture cost is less and so we get these panels in competitive price. Normally with the help of 1 KW Solar panels can produce between 4 KWH to 4.5 KWH electricity per day. ► High quality solar Photovoltaic Silicon Mono / Multi crystalline panels or Cells. ► German cells assures the quality of product. ► It is union of solar cells for desired capacity. ► Light weight and designed for getting maximum utilization. ► Resistant to abrasion, hail impact, rain, water and environmental factors. ► Anodized aluminum frame and pre-drilled mounting holes. ► Tempered glass for rugged protection. ► ISO 9001- 2015 certified. ► IEC 61215 certification by Euro Test and TUV. 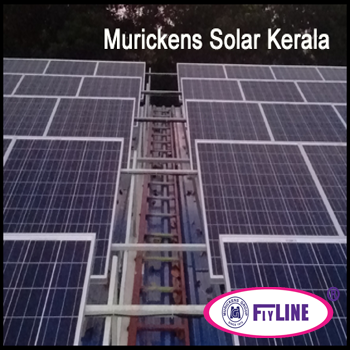 ► 1000 W Flyline solar panel has the capability to generate 4 to 5 units /day. ► Each panel Test specification chart is on backside. The Standard size 65.5" x 39 " 52.5" x 26" 52.5" x 26" 26" x 24"